If a player wishes to join a game in mid-play, he simply draws one of the remaining Coat of Arms and Loyalty cards, and sits to the immediate left of King Arthur (or the player who started the game, if King Arthur is not in play). He then sets his Life dice to 4, draws 5 White cards from the top of the White draw pile, places his miniature in Camelot and waits for his turn to arrive. If a player wishes to leave a game, he is considered to have immediately met a premature death. Any veteran player looking for a bigger challenge may opt to start the game as a simple squire, with no Coat of Arms or Special Power, equipped solely with his Life dice - set to 4 as usual - and a starting hand of 5 White cards and a single Merlin. When a Quest is won, one (and only one) of the Squires present on it will earn his Knighthood. The players can decide which among them becomes a Knight. If no agreement can be reached, the Squire whose action won the Quest is the one who is made Knight. He then becomes a full-fledged Knight, receiving a Coat of Arms and the Special Power that goes with it. Once you truly master this challenge, consider having your Squire start the game with 3 Life points and fewer white cards in hand. Instead of dealing Loyalty cards from the 8 available, take only as many Loyal cards as there are players around the table, add the Traitor card, shuffle and distribute. This makes the game quite a bit harder; While there are no guarantees there is a Traitor in your midst, the probability of one increases dramatically, especially for smaller numbers of players. When the Knights are few, the challenge becomes increasingly greater for the chivalrous amongst you. With only 3 players at the table, we strongly recommend you heed the Recommendations for first-time play on page 8 of this rulebook and initially attempt the Quests without a potential Traitor in your midst. Only once you have become confident in your skills should you consider adding the potential Traitor back into the mix. The Traitor won't appear that frequently amongst your small group (only 3 chances out of 8) but, when he does, his presence will turn out to be devastatingly effective. As such, any player dealt the Traitor card must place special emphasis on playing his role not only by the rules, but also in the spirit of the game. 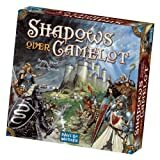 In Shadows over Camelot, the Traitor's challenge is to defeat the Loyal Knights through deception and deviousness, not to simply crush his opponents by openly flaunting his true nature through an obvious string of overt, evil moves. 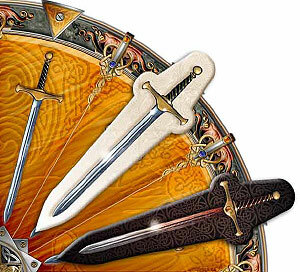 To encourage and facilitate this type of play, in a three-player game, the players should not look at their Loyalty cards when they are distributed at the beginning of the game; instead, the players should wait until at least 6 Swords have been laid on the Round Table before taking a peek at their Loyalty card. Suspicion will now begin to cast its long shadow on Camelot, while the challenges for the Loyal Knights remain significant, regardless of whether one their own was suddenly seduced by the promises of the evil side.